COLOMBIA. Banco de la República. 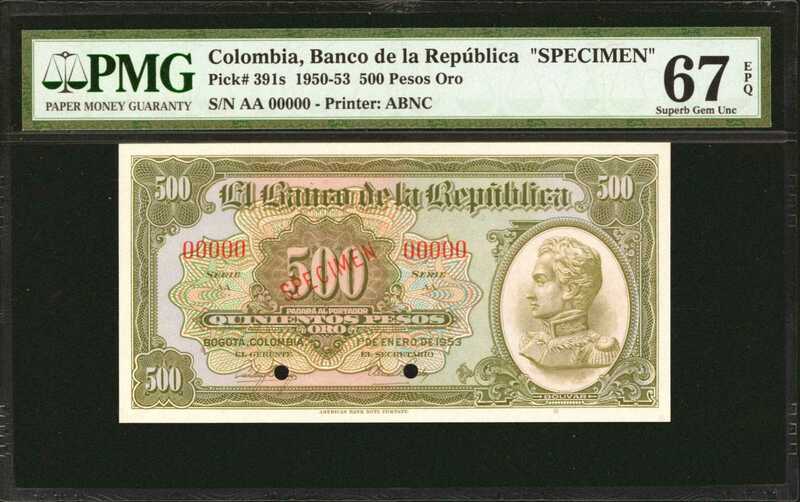 500 Pesos Oro. 1942-1953. P-393s. Specimens.7 notes in lot. This is a remarkable collection that would be nearly impossible to assemble or duplicate. Several of these are ex Amon Carter, Jr. collection. Includes all seven dates of issue of this high denomination P-391 design type in olive and orange: 1942, 1944, 1945, 1947, 1950, 1951, and 1953. All red 00000 serial numbers and stamped SPECIMEN in red. All Gem Uncirculated 66 or Superb Gem Uncirculated 67 except the 1947 is Choice Uncirculated 64 EPQ. All have stunning colors on both sides. An incredible set all across the board.